Ancient curses…family feuds…finding a happily ever after can be a real nightmare for the modern witch! Can Angela McAllister, the head witch of her clan, find true love and solve a century-old curse before it’s too late? 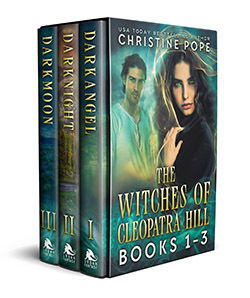 This boxed set includes the first three titles in the Witches of Cleopatra Hill series: Darkangel, Darknight, and Darkmoon.